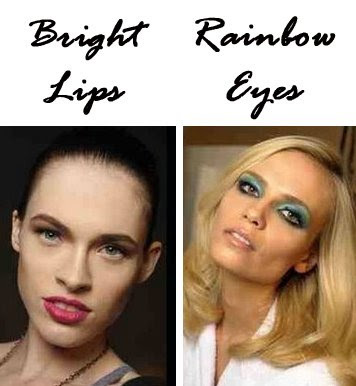 Summer is upon us and as you all know the biggest two beauty trends on the catwalk for this season are bright lips and rainbow eyes. I wanted to share with you products I would use to recreate these looks and also share the inspirational images for my readers as they are quite spectacular. Nars - matt lip pencil in "Red Square" a lovely coral red. Barry - M lip paints in 144 (cerise pink), 145 (punky pink), 146 (dolly pink) and 147 (peachy pink). Urban Decay book of shadows palette - Shattered, Absinthe and Goddess. Mac - Steamy, Moon's Reflection, Contrast and Bio Green. A good buy for multicoloured high standard eyeshadows I recommend Urban Decay book of shadows. What other products do you recommend to help recreate these looks? Love the new blog header! MAC Cremesheen in Lickable. Bright pink heaven. I love your new header! And if I get gutsy enough, I may have to try some of these trends. It's hard to get out of neutrals, unless I'm tan! How are you? I hope ur doing very very well..
thanks for this post :D for bright lips.. def mac vegas volt or bobbi brown pot rouge in calypso coral.. I love the green/blue Gucci eyes! love the new layout! :) very pretty.